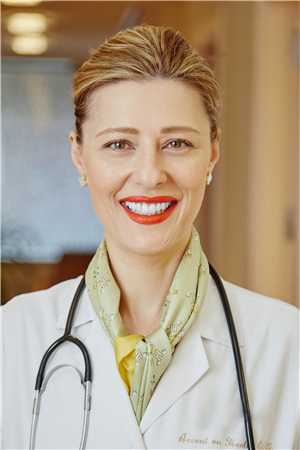 Dr. Meimaris, certified by the American Board of Obstetrics & Gynecology, is the founder of Accent on Health Ob/Gyn, P.C., and a Clinical Assistant Professor of Obstetrics and Gynecology at New York University School of Medicine. Dr. Meimaris is a Fellow of The American College of Obstetricians and Gynecologists, and a past President on the New York Gynecological Society. Dr. Meimaris’ OBGYN residency was at Boston University Medical Center in Boston, MA. The program included rotations at Mass General Hospital with emphasis on Minimally Invasive Surgery, and the Lahey Clinic with extensive surgical training in Gynecologic Oncology. Dr. Meimaris completed her residency training as the Chief Administrative Resident at New York Medical College, Saint Vincent Catholic Medical Centers, NY. Dr. Meimaris is a member and supporter of American College of Obstetricians and Gynecologists; American Medical Association; Society of Laparoendoscopic Surgeons, and the New York Gynecological Society. Dr. Meimaris’ time at the office is spent on treating and comforting her patients as well as teaching medical students.